After showcasing how the new third generation Hyundai Verna looks like, let's find out what major changes the sedan will undergo during its generation switch. Hyundai is on the verge of launching the next generation Verna in India. This will be the third model to fall under the Verna badge on our shores. The current generation Hyundai Verna was launched in 2011 and became a strong seller at launch. However, over time the competition toughened with the new Honda City, especially with the launch of the diesel variant in 2014, and Maruti Suzuki Ciaz coming in. A facelift was introduced in 2015, but it did not do much to save the plummeting sales. On top of it, as a part of the ongoing SUV frenzy, Hyundai launched the Creta – which is technically a segment above the Verna but it did manage to eat into the sedan's sales – as we all know how much we, Indians, love SUVs. While the new car looks unmistakably Hyundai and will carry forward a few bits from the outgoing model, a lot has changed as the Korean manufacturer has worked towards making the Verna the complete mid-sized saloon. Let’s have a look at what will make the new Verna stand out from the old model. The previous Verna lost its characteristic hexagonal grille after its 2015 facelift. Thankfully, that is coming back in the new Verna, however, this time around – it will be based on Hyundai’s new Fluidic Sculpture 2.0 design language. So, the new grille has that ‘cascading’ effect which recently is seen on its newer models. The car’s overall profile, however, looks more in line with the bigger Elantra – the tail lamps and the long under-eye LED DRLs make this pretty clear. Also, the 2017 Hyundai Verna sits on a 30mm longer wheelbase than its predecessor. This is an area where things have taken a big leap. The cockpit of the 2017 Hyundai Verna reflects a lot of design elements from its bigger siblings – Creta and Elantra. The third generation sedan now sports a new 7-inch infotainment system, which supports both Android Auto and Apple CarPlay. The outgoing Verna has good interior plastics overall, but the new model is expected to take it a notch above. Also, given the fact that the new Hyundai Verna will sport larger dimensions, expect the interior space to be a lot more roomier, especially for the rear passengers. The new City and Ciaz have really spacious back seats, and Hyundai has to up its game in order to lure the chauffeured audience. The outgoing Hyundai Verna has the most comprehensive list powertrain options in the mid-size saloon segment. However, with the new Verna, Hyundai had decided to give the 1.4-litre engines a miss, and will only launch the bigger 1.6-litre engines – at least initially. The 1.6-litre petrol and diesel powertrains produce 121bhp and 126bhp respectively and come mated to a 6-speed manual transmission. Hyundai will also offer automatic transmission option with both the motors. This time, thankfully, the company had decided to replace the outgoing car's dated 4-speed with a more modern 6-speed torque converter – similar to the one found on Creta. Hyundai cars, in general, are better-equipped in their respective segments – and we expect the 2017 Verna to be no different. As mentioned before, the car will house an infotainment system with all modern connectivity options. Other features like LED DRLs, cruise control, rain sensing wipers, automatic headlamps, keyless entry with push button start, auto folding mirrors, cooled glove box and leather upholstery – are all expected to be present at least in the top-spec trim. The top variant also comes equipped with handsfree boot opening and ventilated front seats – a first for this segment. Also, with car safety in India receiving a substantial push recently, we expect ABS with EBD, alongside dual front airbags to be standard starting from the base trim on the 2017 Hyundai Verna. Hyundai has given the top-end trim a total of 6 airbags. In order to compete with the segment best sellers, and counter the SUV craze – the pricing will play a key role in the new Verna’s success. Whether Hyundai will be able to compete with the excellent value-for-money Maruti Suzuki Ciaz on the price front is yet to be seen. 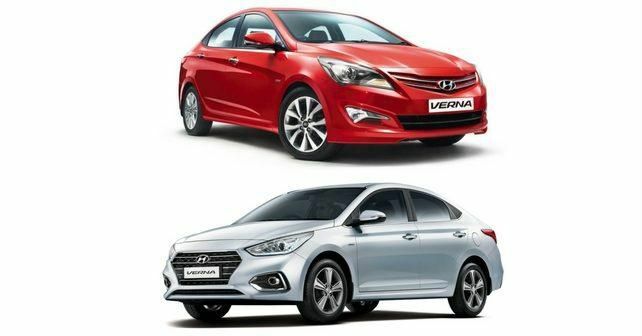 However, expect Hyundai to price the new Verna at par with Honda City. The Verna’s price will also, most certainly, undercut that of its SUV sibling – the Creta. When can you get the new one? The car will launch in India on August 22, 2017. We've had a chance to take the all new 2017 Hyundai Verna for a short spin. Read about it here.